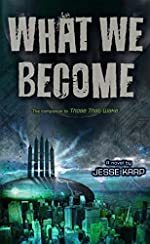 What We Become by Jesse Karp. A Companion to Those That Wake. Review: Do you like a good book full of violence and adventure? Then What We Become by Jesse Karp is the book for you. In What we Become, one of the main characters is Mal. In the beginning of the story, Mal is being beat up by henchmen. Mal tries everything he can to attack, but they still win the hustle. After the fight, the henchmen drag Mal across the floor shattering his pants. The henchmen bring Mal to their leader to talk where he is left to sleep. When they leave, Mal tries to escape. But even if he escapes, he knows he has a difficult journey ahead of him. What is next for Mal and will he ever escape the city and make is way back home? If you want to figure that out, read What we Become by Jesse Karp. I recommend this 5 star novel to any one who likes a good story and a little violence. The suspense will keep readers at the edge of their seats! We would like to thank Houghton Mifflin Harcourt for providing a copy of What We Become for this review. Have you read What We Become? How would you rate it?